Happy Friday, party people! Okay, maybe you are not party people yet, but at least we’re just about to start the weekend. Last night, Dave and I went out to dinner with two of our good friends from Orlando, who are visiting for the weekend. After showing them our little apartment, we all walked to an Italian restaurant, Trattoria Contadina, not too far from our house. Good times were had, as well as some red wine and pasta. Yummy! Okay folks, let’s get right to it. It’s Friday, which means I like to share some unrelated random things that are making me smile lately. I hope you enjoy … and I hope you don’t judge. I had to laugh when I opened this present from Dave on Christmas Day, because I thought he had this shirt specially made for me. I kid you not, this is an exact saying that I’ve used before. Dave works for a basketball team, he loves sports and ESPN is constantly on in our little apartment whenever he’s home. That being said, I like to pretend I have no idea what’s going on in the sports world and will often ask if the basketball players scored a “touchdown” just for fun. Well, this shirt explains it all. I’m a fan, and I always cheer for whoever Dave wants to win, while sitting next to him on the couch scrolling through Instagram, but I’m not exactly die-hard. 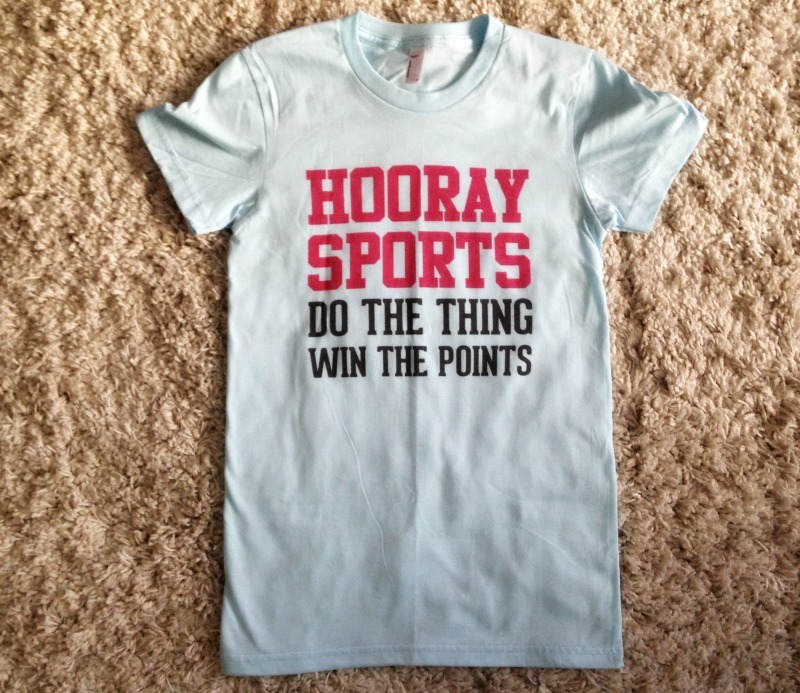 One of the funnier gifts I received this year, the Hooray Sports T-Shirt . The best part of this gift is that Dave only had a paper print-out of the shirt in the box when I unwrapped it. He ordered the shirt online, and sadly, it didn’t make it in time for our Florida departure for the holidays. It’s now in my possession, although I haven’t worn it yet. I think it’s going to make its debut on the streets of San Francisco very soon. Hooray sports! These veggie burgers are all that and a bag of chips. I haven’t bought veggie burgers in years, mostly because I hated the taste of them when I’ve tried other brands before. Something about the packaging of these drew me in, I purchased them, and boy, I’m glad I did. I went through a pack of four this week and already bought a second pack. 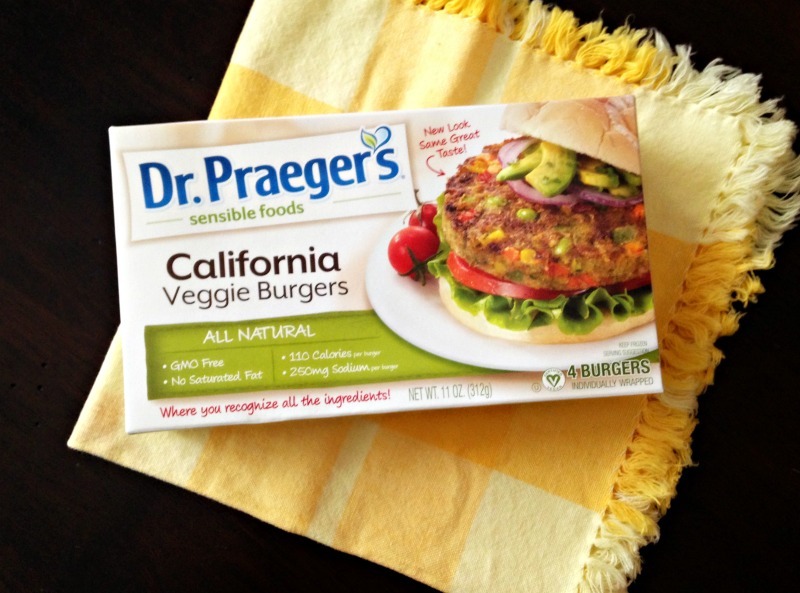 Tasty, convenient and pretty darn healthy, here are Dr. Praeger’s California Veggie Burgers . I picked these up at Trader Joe’s in the freezer section, and I’m sure I will eat them nearly every day obsessively over the next few weeks until I’m sick of them. Sounds like a plan to me. Do you love to clean out your drawers and closets as much as I do? Nothing beats that feeling of purging things you don’t need and giving them away. Even though Dave and I are good at living minimally in our little space (and have gotten rid of so much over the course of the last few years before relocating), we still seem to accumulate t-shirts, junk and things, none of which should make the move with us into our next new place. Eight bags full of things we do not need and will not miss. 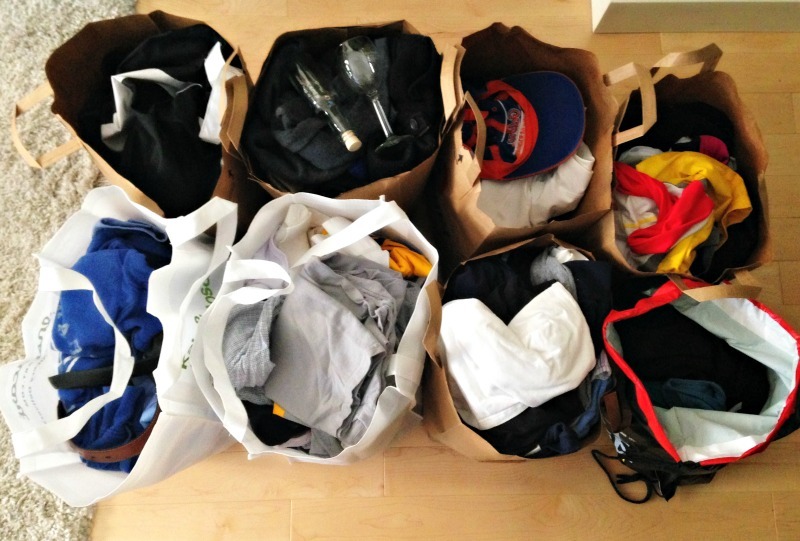 Therefore, on Saturday, Dave and I went through all of our clothing and toys and filled up these bags. That same afternoon, we dropped it all off at Goodwill. And I loved that feeling. I know there are plenty of places to donate clothes, and I’d be interested to look into more. But in the effort of efficiency, we went with Goodwill, picked up a little tax form and got right back into our car. So don’t laugh at me. I see a lot of people out there claiming that there are miracle products that help their hair or nails grow longer and faster, and I’ve never bought into any of it. Well, desperate times call for desperate measures. You see, around the time I got married, my eyebrows went through a phase of over-waxing. Yes, they got a little too thin, and it has been very hard growing them back. I dream of having big bushy eyebrows, but they only grow in very light and thin. A couple of months ago before a trip to Florida (I always get all cleaned up before I head east for a visit), when I was seeing a fancy eyebrow lady with high reviews on Yelp, she suggested a product that is supposed to help your eyebrow hair grow in thicker called eyebrow conditioner. I didn’t believe it. But because I so badly wanted to see the change, I decided to take a leap of faith and ordered the product. 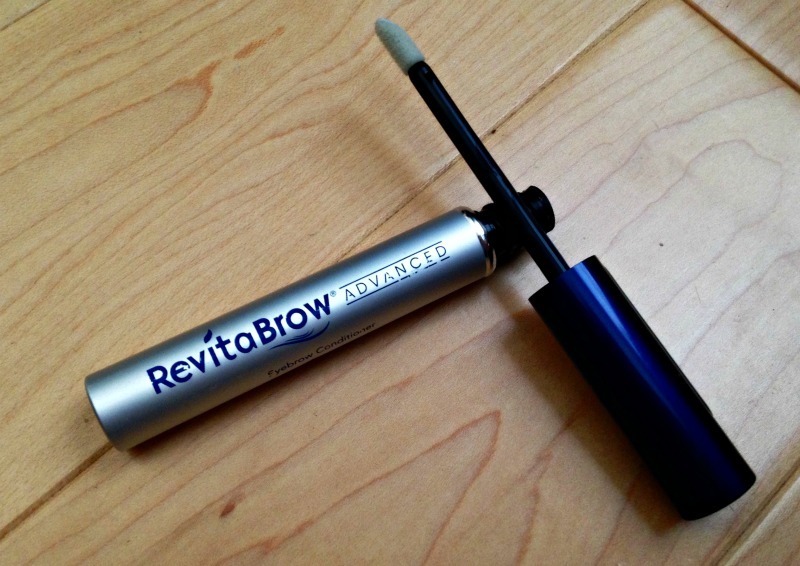 Just one little tube of this RevitaBrow Eyebrow Conditioner has been a game-changer for me. I swear to you, after putting this potion on my eyebrows daily for about a month (which comes out much like mascara), I’m really seeing new little hairs pop up in places that were previously blank. No, I do not have the bushy eyebrows of my dreams, but I’m getting closer to normal. This stuff isn’t exactly a bargain, and when I clicked “purchase” online a little bit of my cheap-self died inside, but I’m now quite glad I did it. I didn’t even think to take before and after pictures, so you’ll have to take my word for it. These two jams just make me want to bop around, so much so that I have to share them with you. Have you heard these two? This singer says what I wish I could when someone offers me another slice of cheesecake. Andy Grammer — Honey, I’m Good. This guy is just so darn talented, and it’s impossible not to dance to this one. Just ask Dave, I’ve got this dance learned to perfection (or at least in my eyes, it’s perfection). Mark Ronson and Bruno Mars — Uptown Funk. Sneakers and fitness — My new ASICS kicks, a full-body workout idea and my weekly workout recap, all in one post. And yes, I wore the sneakers to teach BODYPUMP twice this week, and they were a dream on my tootsies. Online workouts and a giveaway — There’s still time to enter to win a month of unlimited online workouts, so check out Online workout giveaway and Gigabody review. I plan to do a yoga class online today from the comfort of my tiny living room. Technology and food — This one was popular, so I guess there are a lot of Mac users out there who need a little help. See A different kind of training and my eats. Yoga with weights — While this is a San Francisco yoga studio review, there are CorePower Yoga studios all over. Check out CorePower Yoga is hot, hot, hot. And one more thing. I was quoted on The Huffington Post! This is an article that originally ran on The Active Times a few weeks ago, and it showed up on my feed again this week on HuffPost. Yay! You’ve got to love content sharing. Okay, everybody! I’m off to get the day going. Tonight, I have another girlfriend date (Dave’s busy work schedule has done wonders for my social life with my lady friends), a free and easy Saturday, and I’m teaching an outdoor bootcamp in a park on Sunday morning. Have a lovely weekend, friends! Check me out on Instagram, to see if I wear that fabulous shirt out and about. If you’ve enjoyed browsing through this post, see below for previous editions or visit the the link-up hostesses, Heather, Katie and Clare. What’s one thing you have planned for the weekend? Do you have any miracle beauty products to share with me? What’s your favorite song as of late? Dr Praggers veggie burgers are the best. Hillarys Eat Well are also amazing. I only look now for ones with whole ingredients. That’s crazy about your eyebrows. I am always trimming mine. They grow like weeds. I have very thick hair though. Guess it comes with that. Happy weekend! I love that t-shirt! Sums up exactly how I feel about football when Brian is watching it all day every Sunday. I’ll watch, but I’m definitely not that into it. Hi Chrissy! hhaha! I usually just play on my phone or laptop, I don’t even bother watching. 🙂 Hope you have a fun weekend! It always feels great to get rid of stuff you don’t need, especially when you know it’s going to a place in need. Scott and I are in the middle of doing just that in our home. We are calling it “The Purge” lol. Congrats on the Huffington Post mention, that’s awesome!! I hope you have a great weekend! Hahah that tshirt is awesome- I need it ;)! Love the sound of those burgers- the ingredient list is as good as any homemade variety! I have some friends visiting this weekend so the next few days involve a lot of eating out along with a haircut and hopefully a little lie-in tomorrow & Sunday! Have a great weekend, Ashley! I love that tee! It’s so great! Dan has been teaching me about football and that shirt pretty much sums up my knowledge on the topic when he started…but I’m trying! Love those veggie burgers, too! Also..congrats on Huff Post, that’s majorly cool! Happy Friday! Thanks, Ruthie! That’s great you’re getting some tutoring from your man on the sport!! What a good guy. Let me know if you like the veggie burgers. Happy Friday to you! Hi Brie! ahhahah! Yes, I went to a big football school too (University of Florida) and I knew what was going on during the games mostly, but was too busy socializing to watch the game! Winning is more fun than losing, that’s for sure. I hope you have a wonderful weekend! Sue @ This Mama Runs for Cupcakes recently posted…5 Reasons to run in Washington, D.C.
Haha, I do the same thing with the pillows 🙂 I can’t diss my hubby though, he loves to organize and keep tidy as well. I need that eyebrow ‘grower’ like yesterday!!! I went through a phase when I was young when someone told me I had ‘bushy’ eyebrows which led me to pluck them almost to nothing. Ever since they are sparse and grow in all different ways!!!! Hi Fiona! Oh noooo!! Well thin eyebrows used to be much cooler. These days we want them to be thicker. Have you ever trimmed the long hairs? I’m always scared when they do that to me when I get my brows done, but it ends up helping the cause a bit. 🙂 Happy weekend. Don’t fret about your brows too much. Oh yah! My gal trims my eyebrows every time and man does it make a difference! 😉 I’m glad we are in the trauma of think eyebrows together! I am in desperate need of going through my closet, that is on my to-do list next week, such a good feeling! And I may look into that eyebrow conditioner…love finding new beauty products! Happy Friday! Hi Marielle! Closet cleaning feels great! Well for some people I guess. Let me know if you try the eyebrow condition. Have a wonderful weekend. Quoted by the Huffington Post?!!! That’s amazing! So excited for you. Enjoy your weekend. Thanks, Court! I was very excited to see my name on the site when that Google Alert came to my email. Now I just need to get my own article up there. 🙂 I hope you have a fabulous weekend. Doing anything fun?? Another long run I’m sure. Actually my Saturday morning run won’t be quite as long this weekend because I am tapering off as my half marathon is coming up on the 18th and I will need fresh legs! My only plans are a Beachbody Super Saturday event in St. Pete Saturday night. A Beachbody Super Saturday? That sounds awesome! I love big fitness events and haven’t been to one in a long time. Have fun with that, as well as your tapering plan. And yes, I will find my dessert, don’t you worry! Oh I am envious your boyfriend works for a basketball team! I don’t like basketball, but I did used to want to work in sports. I work for a sports website right now, and in the end, I’ve just found the hours and lifestyle too demanding and I’m burned out. I still kind of wish I could be exposed to working for a team, but I’m just exhausted from what my job requires that I don’t think it’s worth it. I am participating in a charity bowling tournament on Sunday with players from our local hockey team, so that should be exciting! Other than that, maybe just some more cleaning and watching Netflix DVDs. Hi Ali! Cleaning and watching Netflix sounds like a relaxing and fun weekend. Yes, working in sports is demanding, because he has to be at all the basketball games on nights and weekends throughout the season. But he loves it. That’s neat you work for a sports website, but I’m sure it is very stressful. Have fun at the bowling tournament! And thanks for stopping by to say hello. Congrats on the Huffington Post mention! That’s very exciting. I love cleaning out closets and getting rid of stuff I don’t use. We are actually doing that in our office/spare room right now. It’s a disaster, but it will be great when it’s done. Glad you found a good beauty product. I believe in miracle products. Good that it’s working for you. Happy Friday! Hi Lauren! Well now I have more faith in miracle products, so I’d be more open to trying others. And you’re lucky you have a space room to clean! 🙂 Happy Friday! Doesn’t it feel so good to clean stuff out and donate? We bring stuff to Goodwill all the time – they make it so easy! Hi Ashley! I bet Hunter will grow up to love sports too! 🙂 Enjoy your weekend! Me too, Sara! Happy Friday to you! Hi Leslie! Sure does, glad you’re a fellow organizer. 🙂 Hope you have a great weekend! I did the same exact thing with my clothes and yes, it feels so good! I love that t-shirt! I can so see my daughter wearing this during football season. I will check out the veggie burgers next time I’m at TJ. Yum, Dr. Prager’s are delish. I’m also a big fan of sunshine burgers – have you tried em? Jamie Walker recently posted…SF fitness events you don’t want to miss in January! Those burgers look pretty tasty! I’ve had that brand spinach patties before and they were really good so I’ll have to try those too. And I had to laugh at your comment saying that you want big bushy eyebrows, lol. I went through a stage in high school when I over plucked mine but luckily a guy I had a crush on asked when I was 18 me why I pluck them so thin and it made me stop then and there. Now I look back at pictures of myself like what the hell was I thinking?! I didn’t notice that yours were too thin but if it makes you feel better to have ’em bushy them I’m happy that’s working for you. Happy weekend! That shirt is amazing. I’ve never been a die-hard fan who actually follows my teams unless they’re in the playoffs, but my grandma knows everyone and everything about the Giants and the Warriors… so her love of sports must have rubbed off on me a little bit because I get really into games when I’m actually watching them haha. Your Goodwill drop-off is inspiring me to do a purge this weekend. I’m a recovering hoarder, but I love the feeling of getting rid of things so I MUST. glad we connected through BlogHer and like what you have going on over here, ashley! i have big bushy eyebrows that i have no idea how to maintain! i got them waxed once and cried but tried so hard to match what she did to me but it’s a jungle over here. Hi Chelsea! Thanks so much for stopping by to say hello. I wish I had a jungle of brows like you, heheheh. And you certainly will deserve a drink after doing some good with your volunteering. Cheers to you. Have a wonderful weekend! Go give your spouse a wink and a hug! Hi Mattie! You should try living in a little San Francisco apartment, when you only have one counter, you CANNOT allow clutter to collect on it. hehehhe Hope you have a great weekend!! OMG, I love that shirt. I’m getting it; so much want! I just gleaned two bags destined for Goodwill from just my closet wardrobe. I haven’t even made it to the rest of the apartment yet, I’m scared we’ll run out of bags. Bringing baby home made me realize we are in fact living with another person, and need to make room for one! Emily recently posted…Happy Birthday, Squish! Well I really only had a long run planned for the weekend and that already happened, yay! My favorite song right now is Sight of the Sun by fun. which I thought was new.. but isn’t lol. That shirt is a hoot! I definitely going to have to try that eyebrow stuff. Thanks for sharing! I tried a Sonia Kashuk kind from Target a while ago. Didn’t see much difference. I have actually stopped donating to Goodwill when I learned how little they actually donate. Most of the money they make just goes to pay for management. So I switched it up and started donating to Salvation Army. It does feel nice to get rid of stuff no longer being used though! Daisy @ Fit Wanderlust Runner recently posted…Carlsbad Half Marathon: Final Week!